Sipsey Street Irregulars: "Give me liberty - or I'll get up and get it myself!" Another Three Percenter blog was born this month. "Give me liberty - or I'll get up and get it myself!" Another Three Percenter blog was born this month. Here's another Three Percenter blog born this month. Longtime trenchant observer GunRights4UsAll, my favorite paraphraser of Patrick Henry ("Give me liberty, or I'll get up and get it myself!") has now jumped into swimming with the sharks on his own account. I can only predict that he will be dorry. Blogging becomes a full-time job if you let it. 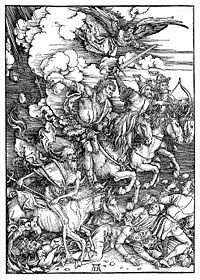 I take note that eschatology is one of his interests, which is why I chose Durer's The Four Horsemen of the Apocalypse to illustrate this announcement. Maybe one day I'll have enough time to discuss it with him. Now is not that time. But check out his blog, certainly. And David's War on Guns blog and Examiner column, and Pete's at Western Rifle Shooters Association, etc. It will give you something to do while I am off the air for a bit. Sir...I am humbled to have received such an introduction. May the fleas of a thousand camels infest the backsides of your enemies, and may none of your shots miss their mark!